SPOILER ALERT! Star Trek: Discovery is losing some key team members. Deadline reports Anson Mount and Rebecca Romijn are leaving the CBS All Access TV show ahead of season three. Both Mount and Romijn joined the sci-fi series at the beginning of its second season as Captain Pike and Number One, respectively. 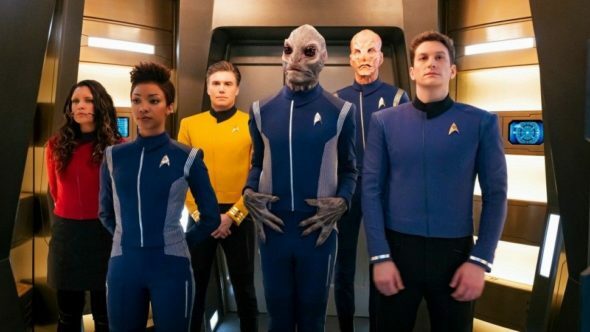 The show’s cast also includes Sonequa Martin-Green, Doug Jones, Jason Isaacs, Shazad Latif, Anthony Rapp, and Michelle Yeoh. According to Deadline, both Mount and Romijn only had one-season deals with Star Trek: Discovery and will not be appearing in season three. The CBS All Access series is currently in the middle of its second season. A premiere date for season three has not yet been announced. What do you think? Do you watch Star Trek: Discovery? Will you watch season three? I will not be around for S3 Discovery. In fact I will be opting out of CBS All Access. Its just not worth it. DISCOVERY just isnt for me.